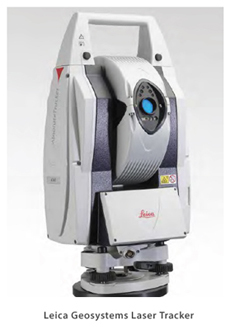 A Leica Laser Tracker is an extremely accurate measuring tool that is used optimize project workflows and achieve on-time deliverables through precise 3D data collection. This portable device can take 3D measurements with an accuracy of better than 0.001". 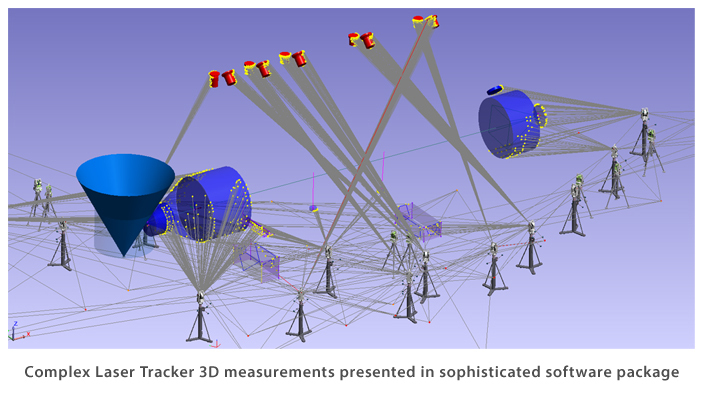 Reality Measurements employs our laser tracking services to provide a wide range of high-accuracy measurement solutions for multiple applications. The very portable Laser Tracker allows for extreme precision measuring over ultra large distances. An internal battery power supply allows the laser tracker to work in the most demanding environments while maintaining the highest level of precision. This is also achieved through the use of the integrated Wireless LAN communication system. This "All in One" system design incorporates vital accessories such as built in live video, level to gravity, environmental monitoring and an integrated IR remote control. The ADM (Absolute Distance Meter) of the Leica Laser Tracker has a resolution of 0.1 micron and a maximum uncertainty of 10 microns over a full 160 m radial volume; making it one of the most accurate Leica Geosystems distance meter on the market. Laser Tracking has now become the highest possible means of gathering the most accurate and reliable 3D information attained in nearly any measurement environment.